Viewers of MTV will get a sneak peek of the new Xbox console ahead of the machine's debut at the E3 games conference in Los Angeles. Microsoft and MTV have entered into an agreement to cross promote each other's products as the battle to win the next round of console wars steps up. The new console will be featured on various MTV channels around the world on 12 and 13 May. The machine will be unveiled to the press and trade on 16 May. Sony will show off its PlayStation 3 machine on the same day while Nintendo is also expected to unveil the Revolution during the E3 games conference. None of the three companies has said when its machines will be released. Peter Moore, corporate vice president in charge of Xbox marketing, said Microsoft felt it was important that fans got to see the system at "at least the same time, if not before, folks who work in the trades see it". Microsoft has also released details of developers producing titles for the new machine. The list includes four of the biggest companies - Electronic Arts, Rockstar, Ubisoft and Vivendi. The full line-up is: 2K Games, Activision, Atari, Bandai, Bethesda Softworks, Buena Vista, Capcom, Codemasters, Eidos, FromSoftware, InterServ, KOEI, Konami, LucasArts, Majesco, Midway, Namco, Phantagram, SCi, SEGA, Tecmo, THQ, TWP and Webzen. While no specific details about the machine's architecture has been officially released, experts predict the console will be powered by three 64-bit processors. 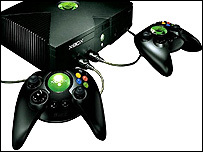 The new console will also make use of the Xbox Live online gaming system, with increased use of downloads. Games are expected to be much more customisable, using micro transactions to buy and download improvements and changes to profiles and characters. Sony's new machine will make use of the Cell processor, a new type of chip which has been developed in conjunction with IBM.